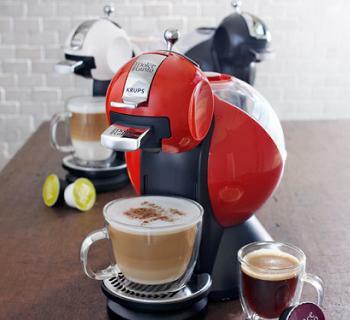 Hands down, the new Nescafé Dolce Gusto from Krups is one of the cutest single-serve espresso machines on the market. Available in three different colors, they all basically look like little round birds perched on your countertop. The black model reminds me of a penguin. Cuteness aside, these are pod espresso machines and, like most, they do tend to put convenience over the coffee. The pods – called capsules, as they have a new design – are good quality and will brew a much larger cup of coffee than many other pod machines, and the resulting coffee will not taste as watered down as others (a big problem, I’ve found). This is because of an unusual feature of the machine: it is not fully automated. There is a lever at the top that allows you to adjust the water flow, so that you can control the temperature of the drink – hot water or cold – as well as the strength, by adding more or less water. This is a nice feature when you compare it to many pod machines that turn out very watered down cups. The capsules are not bad, but there is one that stands out from the rest. The Cappuccino Ice flavor is a cold, sweet, frothy drink that comes out of the machine perfectly mixed and ready to drink. This is made possible by the cold water control wand. This was, hands down, the best flavor I tried and good enough that I’d want to drink it again and again.